100 Goals and 150 Marks. The Best of the Best Full Forwards — The Mongrel Punt Become a Patron! The last man to kick 100 goals in an AFL season was Lance Franklin, ten years ago. Prior to him, only two other players had achieved the feat this century – Fraser Gehrig in 2004, and Matthew Lloyd in 2000 and 2001. We love some obscure statistics at The Mongrel. More than that, we like making up our own. We’ve highlighted the 50-100 Club recently, and the AFL Quadruple Double, and since we’re on a roll, why not up the ante and add another to the bunch of Mongrel Stats? 100 goals in a season is extraordinary. It’s been done only 56 times in the history of the VFL/AFL, with names like Lockett, Dunstall, Hudson and McKenna making the list multiple times. The strength to these forwards was always their marking ability. On the lead, or one-out in the forward line, they had the uncanny ability to beat their opponent and take a grab. Whether it was Dunstall meeting the ball full chested, or Lockett overpowering his defender, it was that aspect of the game that allowed so many shots on goal. But who was the best mark-kick man in history? To properly assess this, it’s unfair to base it on one statistically high season. A player like Peter Sumich kicked the ton only once, in 1991. His 111 goals came in a year where he collected 171 marks; a truly great season by anyone’s measure, but in terms of consistency, Sumich was a flash in the pan. For a number of reasons, Sumich was unable to climb those heights again. His next best haul was 90 goals in 1990, and that was accompanied by 139 marks. His high was blisteringly high, but sustaining that high was beyond him. To kick 100 goals and combine it with 150 marks in a season is an achievement that will, sadly, rule out many of the old timers. Detailed statistics of their careers are simply unavailable. What we are able to do is concentrate on the statistics we do have at our disposal, and the good news there is that it captures a period where some of the greatest forwards we've ever seen played the game. Whilst we're 100% certain that no former player, or current player will lose sleep over not obtaining the stats to fulfill this criteria, it is just another little wrinkle, and another little stat in this game that we love. First of all, we'll take a look at those who were close, but just missed out. Gary Ablett Senior was one I thought would have at least one season where he hit this mark following his move into the Geelong forward line. The closest he came was in 1995 when he booted 122 goals but missed out by just two marks on cracking 150. Doug Wade booted 127 goals in 1969 but his 139 marks left him 11 short, while Alex Jesaulenko kicked the ton in 1970 with 115 goals, and added 141 marks to fall short as well. 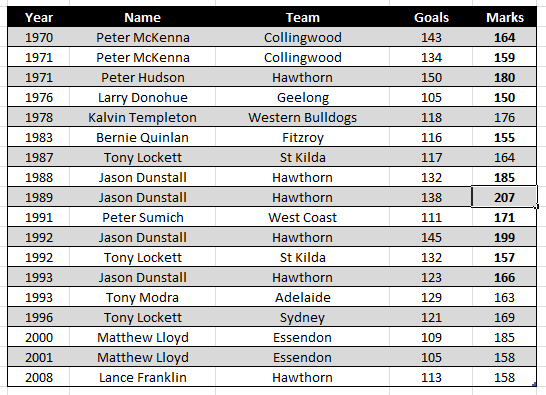 Peter McKenna beat out his rival, Peter Hudson to be the first man to ever achieve the 100 goals and 150 marks in a season milestone. McKenna had 164 marks to go along with his 143 goals in 1970. Hudson wasn’t far behind, with 146 goals, but fell ten marks short of the target, with 140 for the season. He’d rectify that in 1971, having his best statistical season to kick 150 goals, combined with 180 marks. Not to be outdone, McKenna went two from two in ’70-71. He compiled another stellar year, registering 134 goals and taking 159 marks. Hudson was the first of the one hit wonders, never reaching the mark again. Others to do so include Geelong’s Larry Donohue in 1976. Donohue is not spoken about in the same manner of other gun forwards of his era, but his 1976 season must have been something to behold. 150 marks went along with 105 goals for the year as the Cats finished fourth. Kelvin Templeton won a Brownlow in 1980, but his 1978 season saw him register his only 100-150 season, with 118 goals and 176 marks. This season included his incredible 25 disposal, 16 mark, 15.9 performance against St Kilda. Bernie Quinlan kicked 100 goals in a season twice, but it was only his 1983 season that saw him take enough marks. While Quinlan’s 116 goals were a career-high, he actually took more marks in a season 12 years earlier. He took 168 marks in 1971, but only returned 48 goals. In 1983, he got the equation right, grabbing 155 marks. We touched on Peter Sumich before, but another star forward sat atop this statistical mountain as well. Tony Modra’s greatest season in the league was when he was still a baby in football terms. In just his second season, Modra sat on enough heads to pull in 163 marks, and kick 129 goals. He never reached either of those heights again, his next best in each category being 93 marks and 84 goals in 1997. Still, it cannot take the gloss off what an amazing season he had in ’93. The last swinging single on our list is Lance Franklin. You guessed it – it was 2008 that Buddy climbed this ladder. His 113 goals combined with 158 marks secure him a spot in this exclusive club. Franklin has been close-ish since. He has had the marking component covered in both 206-17, but his goal tally has fallen well short, his closest effort in ’16, when he bagged 81. And now we move to the guys who were able to back up their performances. Peter McKenna was mentioned above. His 1970-71 seasons set a benchmark in this stat that was not equalled until 18 years later. His combined totals over that two year period are 323 marks and 277 goals. As good as Lloyd was, Tony Lockett was a class above again. Plugger managed to pull off the feat three times. His first trip to the power forward’s statistical Everest occurred in his 1987 Brownlow year when he slotted 117 goals to go along with 164 marks. Five years later, Lockett was at it again, compiling an even more impressive set of numbers. His 132 goals were accompanied by 157 marks. In 1996, Lockett proved that his move to the Swans had done nothing to hamper him when he kicked 121 goals to go along with 168 marks. As if you needed another reason to worship Lockett as the greatest full forward of all time, right? And this “more” may just swing one or two easily swingable people to the side of Jason Dunstall. You see, Dunstall is the only man in history to hit this statistical height four times. The Hawthorn full forward first hit the mark in 1988 when he slotted 132 goals and took 185 marks. He then outdid himself with 138 goals and 207 marks in 1989. Amazingly this would make him the only man to ever kick one hundred goals in a season, and combine it with 200 marks. Three years later he almost did it again. His 145 goals in 1992 combined with 199 marks, robbed by one grab of the chance to sit clearly atop this stat with no chance of someone catching him. This season also marked the year that Dunstall recorded an amazing 17 goals 5 behinds against Richmond. He also dragged down 18 marks that day. It was a once in a lifetime season. Dunstall finished his quadrilogy of forward dominance with a 123-goal, 166-mark performance in 1993. Of the current crop of players, Franklin is the obvious choice as one who could reach this mark again, having been there before. At 32, there is an expectation that he will drop away, but he has showed no signs, racking up over 150 marks in two of the last three years. Joe Daniher took 153 marks in 2017 but must increase his goalkicking by a significant margin to reach the ton. That said, he finished with 65 in 2017, a leap of 23 goals from his 2016 total. Up until 2018, he was on track to be kicking 150 goals in a season by 2021! Seriously though, consistent improvement and an injury-free run could see Daniher eventually kick 100 goals in a season. He’s already got the marking side covered. Taylor Walker and Charlie Dixon are the only other two forwards who made, or in Dixon’s case, almost made the 150 mark total, but their goalkicking totals would have to be doubled to get there. Josh Kennedy could kick 100 goals in a season, and in 2015, he did take 168 marks, so it’s not beyond the realms of possibility. With that said, I do not think we will see anyone join the 100-150 club in the near future. Dunstall’s achievement is actually quite unbelievable and not one I can see being challenged, let alone broken. A season with 150 marks and 100 goals the way the game is currently played could be close to the best season by a forward of all time. I just don’t think we’ll see it.